Ruth I. Tabor age 90 of Ashland died Sunday July 20,2008 at the Crystal Care Nursing Center. 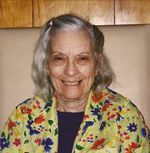 Born on January 29, 1918 the daughter of William Earl Metcalf and Hazel Jane (Stahl) Metcalf she was an Ashland resident most of her life were she was a homemaker. Surviving are one daughter Rebecca Joy Workman of Huntington Beach California, one sister, Helen Sloan of Ashland also survives. Mrs. Tabor is preceded in death by her parents, one sister Phyllis Risser and one brother Kenneth Metcalf. A graveside funeral will be held on Wednesday July 23, 2008 at the Jeromesville Cemetery at 10:30 a.m.